"This is so simple, yet delicious. Store bought apple sauce may be substituted for the apple and sugar mixture. Serve with new potatoes and side salad." Put apple in a pan with water and sugar. Cover and cook on low heat, stirring occasionally, for 10 to 20 minutes until cooked and pulpy. Place pork chops under a preheated grill and cook for 5 to 10 minutes on each side. Cover each pork chop with some of the apple sauce mixture then with cheese. Return to grill and cook until cheese melts and is bubbling. This recipe truly was quick and easy. Everyone loved it! I will certainly be adding it to my family's favorites. Very easy and very good. The apples and cheese are a different yet delicious flavor combination to go with the pork. I will definately be using this recipe again! This was a nice easy recipe that I would recommend to anyone wanting a little different flavor. 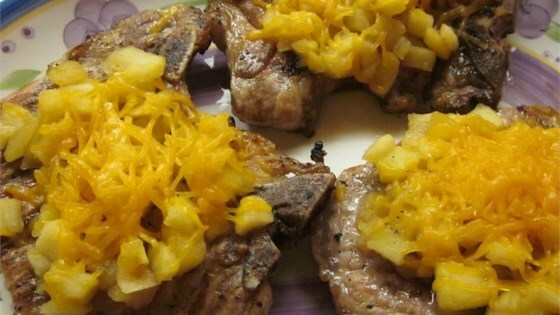 Apples & cheddar cheese on pork chops; awesome! Thanks for the recipe! Traci H.